Some people share photos of holiday things, others share cute kitty movies. I’m more of a coffee related images sort of posting fool. 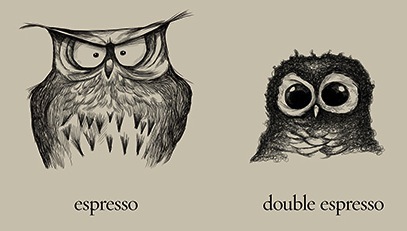 Last week I stumbled upon a fun bit of coffee humor art. We all know Owls for their big eyes. 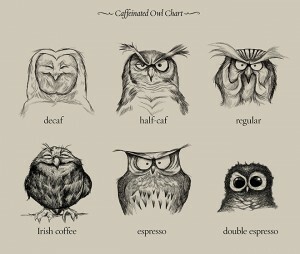 Well, how would those eyes look if our friends of the late night drank coffee or espresso? Not just one grind, but a variety of coffees. Maybe what makes it a bit more fun is I have co-workers with similar reactions to the many coffees available in the kitchen. The above is just two of the full graphic, which is available from the artist to have printed. Making a nice gift for the coffee fan in your life. Next post: You can still have a cup of coffee when there is no coffee maker available!